Does anybody recognise any of the players in this 1955 team photo of Shoreham Boys Club? Seated, 2nd from the right is Ron Hyde, 2nd from the left, myself, Keith Upward. The Manager was Bert ? Most of us came from either Hove or Portslade. I remember one of the clubs that we used to play against, was Hove Penguins. We trained twice a week in an old barn, pounding the floorboards. It was too dark to train outside, no lights in those days! school”, back row extreme right is Joe Wade, standing next to Joe is Mike Williams. I played on different teams with all three. If that is you sitting next to Fred Mepham then I recognise you! Cheers. Hello Keith, the manager’s name was Bert Eliott. 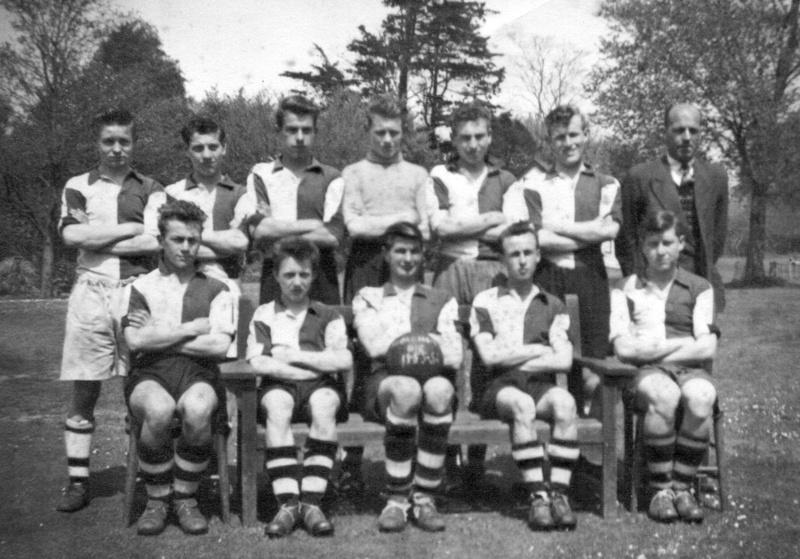 Back left, Peter Saunders (good player), goalkeeper Dave Virgo, captain Ted Wells (class player), bottom right – Lionel ? Hope you are all well and I’d like to find out who the other players were, 2nd from left top and 2nd from left bottom. Cheers. Nice to hear from you Joe, 2nd from left seated is me. Can’t remember the other one. Keep in touch. Hi again Joe – Nearly got it sorted. Which one was Ted Wells? Seated in the middle with ball? Front seated: Fred Mepham, Keith Upward, ? *** Ron Hyde, Lionel **? I’ll email this to Tug, maybe he can fill in the gaps. I thought you may be Interested in the following listing on e-bay item #160403604616 which shows The Brighton & Hove Albion Football Challenge Shield dating from 1921. Hove Penguins won this trophy.